Happy New Years (a few days early)! Since 2013 is just around the corner, its time you get your lucky black-eyed pea recipe on the menu for Monday night! Shelley was never a huge fan of black-eyed peas, but when you live in the south, you don’t have much choice. Eating black-eyed peas on New Years Day is good luck and is supposed to bring prosperity. Shelley’s salad takes regular canned black-eyed peas to the next level. 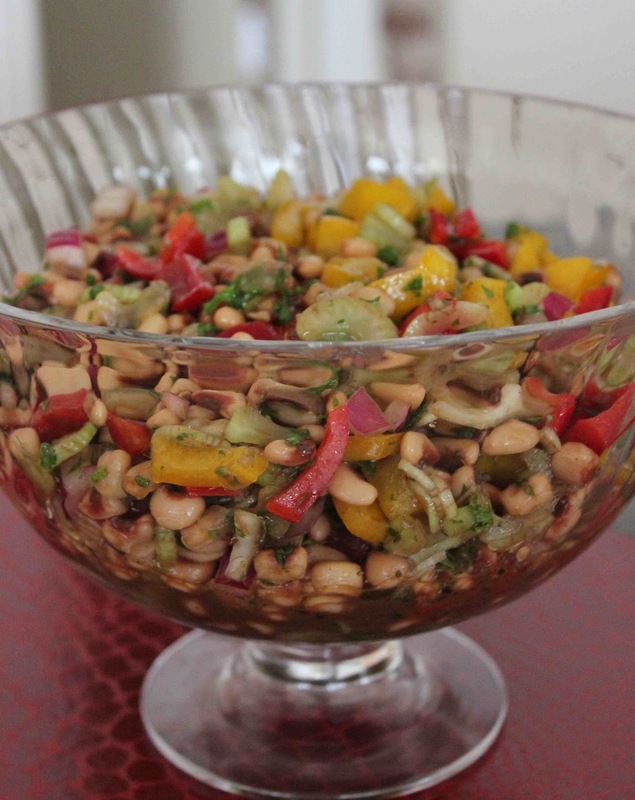 She makes this salad every New Years Day, and people who say they don’t like black-eyed peas LOVE this salad! 2. Prepare Salad: Mix salad ingredients and gently toss with vinaigrette. Refrigerate 1-4 hours. 3. Add parsley just before serving, reserving a little to sprinkle on top for garnish. *Note: Can be served on a bed of greens for decoration. Salad tastes better the next day.